After easing for four months, the nation's economic stress worsened in June because more bankruptcies in the West and foreclosures outside the Sun Belt outweighed lower unemployment, according to The Associated Press' monthly analysis of conditions around the country. The setback halted a drop in month-to-month stress readings that had begun in February. In May, economic stress had declined from the previous month in 33 states. And in April, stress fell in every state but two. But in June, bankruptcy rates rose in Utah, California, Colorado and Idaho. Higher foreclosures spread to the Midwest, particularly Illinois. This occurred even as foreclosures eased in states that have suffered most from the housing bust, such as Arizona, California, Florida and Nevada. More than two-thirds of the nation's 3,141 counties, and 37 of 50 states, endured more hardship in June than in May, the AP's Economic Stress Index shows. The AP's index calculates a score for each county and state from 1 to 100 based on unemployment, foreclosure and bankruptcy rates. A higher score indicates more economic stress. Under a rough rule of thumb, a county is considered stressed when its score exceeds 11. The AP's index found the average county's Stress score in June was 10.5, up from 10.3 in May. About 42 percent of the nation's counties were found to be stressed. That was slightly higher than May's reading of 40 percent. The reversal of improvement reflects a slowing economy. "The U.S. recovery has lost momentum as of midyear and is struggling to find its footing," said Lynn Reaser, chief economist at Point Loma Nazarene University in San Diego and president of the National Association for Business Economics. Risks to the recovery are growing. Unemployment is stuck near double digits. The ailing housing market is pressuring home values. 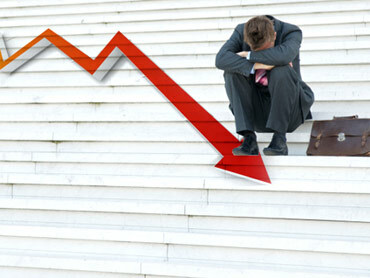 The stock market has been roiled by Europe's debt crisis and concerns about the U.S. recovery. As consumer confidence has sunk, shoppers have cut back on borrowing and spending. Even though they're sitting on record piles of cash, businesses, too, are wary. They're not using their money to expand operations or increase work forces shrunk by the recession. Unemployment rates fell in most states in June, but it was mainly because more people gave up searching for work and were no longer counted in the labor force. The most economically stressed states became more so in June, the AP's analysis found. Nevada, with a score of 21.93, again led the nation as it has for more than a year. It was followed by Michigan (16.52), California (16.32), Florida (15.6) and Arizona (15.13). The healthiest state was again North Dakota (4.83). Next came South Dakota (5.02), Nebraska (6.22), Vermont (6.5) and Wyoming (7.33). All but six of the 56 counties along the Gulf Coast in Alabama, Florida, Louisiana, Mississippi and Texas endured higher economic stress in June. But since the BP oil spill, the economies in the region haven't fared the same, according to the AP's index. All of coastal Louisiana's parishes have endured higher economic stress since April. So have all but one of the 17 coastal counties in Texas and two of the three in Mississippi. Higher unemployment is the main reason. By contrast, Alabama's two coastal counties have seen declines in economic hardship, along with more than half the 23 Florida counties on the Gulf Coast. The improvements result mostly from lower unemployment and fewer foreclosures. In the past several months, Nevada, Utah, Arizona and California in the West have joined Georgia, Tennessee and Alabama in the Southeast among the states with the highest rates of bankruptcy filings. The Southeastern states have perennial high rates of bankruptcy. But among the Western states, the higher bankruptcy rates stem mainly from rising numbers of foreclosures and more people whose homes are now worth less than what they owe on their mortgage, said Samuel Gerdano, executive director of the American Bankruptcy Institute. The current bankruptcy filings are a product of the earlier collapse of home prices in those areas, Gerdano said. "Before the bursting of the housing bubble, Nevada wasn't in the top five" among states with the most bankruptcy filings per capita, Gerdano said. "If you've been to Las Vegas, they're hurting." Month-over-month, the biggest improvements in June were in the Pacific Northwest and New England, primarily due to jumps in seasonal employment. Counties of at least 25,000 residents with the highest stress levels were Imperial County, Calif. (31.68); Yuma County, Ariz. (28.37); Lyon County, Nev. (26.81); Nye County, Nev. (24.78); and Merced County, Calif. (24.3). On the other hand, stress declined in counties whose work forces are heavily involved in farming, mining, manufacturing and hospitality, according to the AP's analysis. Many are in the Dakotas and Kansas. The healthiest in June were Ward County, N.D. (3.85); Brown County, S.D. (3.89); Ellis County, Kan. (4.13); Ford County, Kan. (4.32); and Burleigh County, N.D. (4.35).